Hi friend! I hope your week has been splendiferous! I have been getting settled after my week in Vancouver and spent all afternoon yesterday washing and prepping my veggies for the week. Meal prep really is the best way to ensure you’re eating the most nutritious foods without spending all day in the kitchen. If you want to learn to be a meal prep rockstar, you should sign up for Meghan Telpner‘s Meal Prep Made Easy Challenge. You’ll have all the tools and support you’ll need to avoid spending all your spare time in the kitchen. Check it out here. Now, to the good stuff! 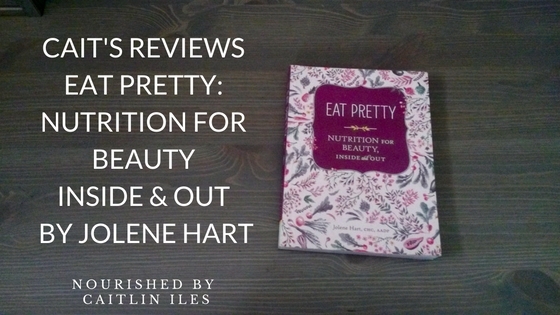 Today I’m going to review one of the best books I’ve read in the last 6 months, Eat Pretty: Nutrition for Beauty Inside and Out by Jolene Hart, CHC, AADP. I’m not going to lie; I picked up Eat Pretty at Indigo because it was just so darn pretty! To be fair I did also read the inside cover to see what it was about, but my primary reason for buying it was that it was pretty and pink and covered in flowers. But don’t let this book’s jazzy cover fool you, it is jam-packed full of scientifically sound nutrition information. As the title suggests this book is geared towards teaching women how to eat the foods that promote optimal beauty from the inside out. Jolene Hart worked in the fashion industry for years before realizing that all the creams, potions, and lotions in the world couldn’t make up for a poor diet, lack of sleep, and insane amounts of stress. She then realized that that tired old adage “you are what you eat” was truer than she had previously believed. From there she commenced a wellness journey, getting certified through the Institute for Integrative Nutrition and the American Association of Drugless Practitioners that culminated in the founding of Beauty is Wellness (check out her website here) and Eat Pretty. Part 1—Rethink Beauty contains a chapter that discusses common beauty betrayers, those foods that wreak havoc on your body, hair, skin, and nails. These foods include: inflammatory conventional dairy, fried foods, alcohol, caffeine, foods from BPA lined cans, gluten, grilled and overcooked foods, conventional meats, pesticide sprayed produce, processed foods in general, soda, and the mother of all inflammatory foods: SUGAR! While I think she could have devoted a section specifically to those fats and oils that cause damage to the body, she does incorporate a small blurb on them in the fried foods section. However, she does a great job of explaining how these foods harm your body in terms of genomics and epigenetics, free radical damage, acidity, mitochondrial burnout, AGEs (advanced glycation end products), and oxidative damage. She essentially goes into the science behind the fact that every bite you eat sends a message to your body to create either health or disease. I love the sciencey technical part of the book, but never fear! It’s explained in such a way that you do not need a science background to understand the core concepts. After discussing the foods that harm your body, Jolene then explains the Eat Pretty philosophy, which is predicated on the creation of a healthy relationship with food free from restrictive habits and guilt. She explains that you have likely become disconnected from your body and the signals she sends to you when she’s out of balance and how you can start listening to her messages once again. The Eat Pretty philosophy goes beyond simple nutrition to the belief that nourishment “takes many forms in your body. Beyond nutrition, beauty is fed with your thoughts, and the way you sleep, move, feel, and even digest” (34). You may have noticed at this point that while Jolene is targeting her audience via a healthy vanity, when she says beauty it is in fact synonymous with health. From here Jolene goes into detail about specific macro and micronutrients, antioxidants, minerals, phytochemicals, vitamins, enzymes, and electrolytes and how they function in your body to send the messages that create vibrant health, the side bonus of which is glowing skin, shiny hair, and strong nails. Part 2: Four Seasons to Eat Pretty is perhaps the most useful section in the book. It is broken up into the four seasons and goes into detail about what foods are in season when, which nutrients they contain, and how they promote healthy skin, hair, nails, etc. Each section also contains a selection of delicious recipes that take advantage of the produce available each season. I will often use this section as a reference when I’m deciding which foods to recommend to clients or myself for specific concerns. Part 3: The Essential Beauty Players—Beauty Beyond Your Plate is a fantastic ending to the book as it goes into detail about all the other super important aspects of health and beauty that you may overlook, even when your diet is perfect. She discusses how you’re not necessarily only what you eat, but also what you absorb and thus highlights the importance of proper digestion and assimilation. The role of the liver, healthy gut bacteria, mindfulness, and specific digestion supportive herbs in promoting beauty is thoroughly defined and Jolene includes tips you can incorporate into your daily routine. She also discusses the importance of hormonal balance, adequate and restful sleep, emotional health, and of course exercise in creating a body and glow that all your friends will envy. Ultimately, I absolutely adored this book and it rarely makes it to my bookshelf because I refer to it so often in my day-to-day life and nutrition practice. It contains enough science to keep us techie nerds happy, while remaining approachable and relevant to those who are just looking to make their lives and bodies more beautiful. All in all I definitely recommend this book to practitioners and clients alike, as I think there is tons of fantastic information on how to create a balanced body and lifestyle that is applicable to everyone, not just those seeking glowing skin. Thanks for stopping by friend. If you want to pick up a copy of Eat Pretty: Nutrition for Beauty Inside & Out then check it out here. Have a wonderfully whimsical weekend!